Budget or Luxury Safaris. 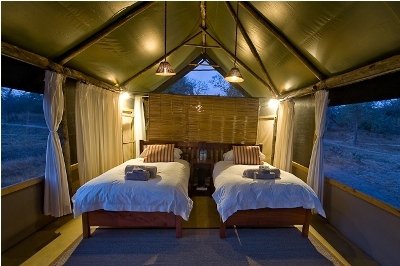 Participation camping safaris and non-participation camping safaris. Some have set departures, some can be customized to meet client requirements. One of the joys of a Zambia safari is that you'll stay in small safari camps that will tailor their activities around your interests. Most safari camps in Zambia provide two activities per day: one in the morning, the other in the afternoon, each lasting about three or four hours. Typically you’ll spend your days (and evenings – something that is not possible in national parks in many countries) exploring either from open-sided 4WD game vehicles, affording all-round visibility, or on foot. Zambian safari guides are trained to very high standards, including stringent practical tests, which will add enormously to your safari experience. Camps near navigable rivers, for example in the Lower Zambezi, will usually also offer boat safaris, as well as canoeing and fishing. For almost all of these, you will be given the options at the camp, so there's no need to decide before you get there. The exceptions are a handful of tiny bushcamps in the more remote areas of South Luangwa National Park, which offer only walking safaris. If you like walking, then you can't beat spending a few days at one of these – their focus gives them a great atmosphere. In some places you can opt to walk between bushcamps, perhaps starting and ending at slightly bigger camps which offer driving as well as walking activities.